The altitude of timberlines in the central Apennines has lowered over the past few thousand years due to interacting natural and anthropogenic disturbances. These timberlines are usually sharp and consist of coppiced beech forests. We found scattered individuals of European black pine (Pinus nigra Arn.) at two high elevation sites above the timberline on limestone slopes. We investigated the spatial and temporal pattern expansion of black pine and assessed vigour and growth dynamics of pine trees. Over 250 individuals were mapped in the two sites using GPS. Several site and tree parameters were measured. Tree-ring widths and the frequency of intra-annual density fluctuations were also recorded. Black pine expansion started around 30 years ago. Pine trees are randomly distributed at higher elevations with no visible spatial pattern. Germination peaks were synchronous in the two sites, and tree growth displayed very similar chronologies, with synchronous occurrence of intra-annual density fluctuations. We hypothesise that the reduced livestock grazing over the last decades as well as climate warming are the major driving forces behind the high-altitude expansion of black pine on the central Apennines, where this species was present in pre-historic times. Alma Piermattei has collected most of the field data, run most of the analyses, wrote the first draft of the manuscript and organized the revision editing. Francesco Renzaglia provided the cartographic layout (GIS based) and designed the geostatistical analysis. Carlo Urbinati has designed the experiment, collected some of the data, supervised the work, wrote the final draft and final revision editing. We wish to thank the Monti Sibillini National Park for sampling authorization, Andrea Cola, Simone Cingolani and the TreeringLab staff for field and laboratory assistance. We are also thankful to Dr. Paride D'Ottavio (UNIVPM) and the “Azienda Speciale del Catria” for information on livestock and pasture management; to Patricia Crotty and Alison Garside for English text revision and two anonymous referees for helpful comments. The study was partially financed by the UNIVPM “Ateneo” Research project no. 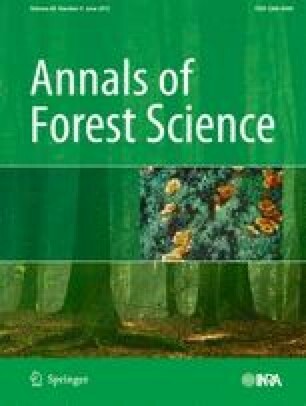 4524/2009 (Spatio-temporal dynamics of forest vegetation and climate change in the Marche region).